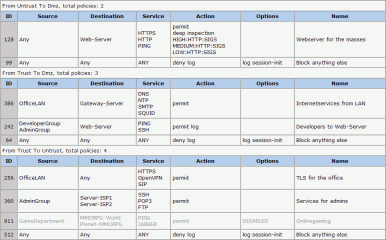 To make reading the generated htmlpage as easy as possible, it is styled in a similar way like the original policy display of the firewall. If you need the generated documentation in a spreadsheet-format like Excel (TM) or Open Office Calc (TM), than just drag the htmlfile into a new spreadsheet. This works very well with Excel 2007 (TM) and Open Office Calc 3.2 (TM). A usage information will be shown, if you just start Junipiper without any commandline parameters. As this program is free of charge, there is no warranty for the program or it's functionality, use it at your own risk. Selling or redistribution of this program is not allowed without a written permission from the author.